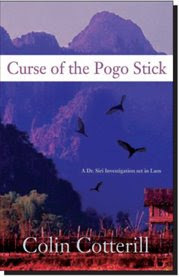 Now showing at My Book, The Movie: Colin Cotterill's Curse of the Pogo Stick. The Page 69 Test: Anarchy and Old Dogs. My Book, The Movie: Curse of the Pogo Stick. 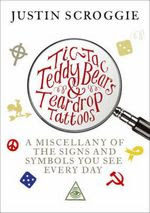 Justin Scroggie is the author of Tic-tac Teddy Bears and Teardrop Tattoos. For the Guardian, he named a top ten list of books with secret signs. I'm an author (and television producer) with a passion for secret signs – all the ways that people in the know privately communicate with each other. I love books where something hinges on a sign or a symbol that the protagonist has to decipher. Authors are playful people, too, so I'm always on the lookout for any hidden messages they might have included, in a character's name, for example, or even on the cover. William of Baskerville arrives at a Benedictine abbey in medieval Italy to lay the groundwork for a theological meeting. Instead, there is a gruesome murder, and Baskerville (a pun on Sherlock Holmes), investigates. The plot revolves (and revolves!) around a secret book by Aristotle, hidden in a labyrinthine library. To penetrate the library and its secrets, Baskerville must decode manuscripts, solve riddles and much much more. Umberto Eco's 1980 classic is full of secret signs, from the abbey door to the abbot's ring – not surprising as Eco is a professor of semiotics, the study of signs and symbols as a form of language. Read more about Scroggie's list. Pg. 69: Mike Walsh's "Bowling Across America"
The current feature at the Page 69 Test: Bowling Across America: 50 States in Rented Shoes by Mike Walsh. Inspired by his father’s unexpected passing, Mike Walsh, a 27 year-old Chicago advertising executive, quits his job to embark on a one-of-a-kind quest. The destination: bowling alleys in each of the 50 states. Though dubbed "career suicide" by colleagues, the endeavor soon touches a nerve among many people­—­from frustrated middle managers to radio talk show hosts to a woman who merely identifies herself as "Bowling Spice" in an innuendo-laden email. Conversations and adventures with the people he finds in bowling alleys at all hours of the day and night—retired Maine lobstermen, saucy European nannies, recovering addicts, former bowling champions, college students, World War II vets and lingerie saleswomen, to name a few—combine to form a picture of what America looks like while standing in a pair of rented shoes. Learn more about the book and author at the Bowling Across America website and blog. Mike Walsh is one of the world’s leading authorities on the geographic nuances of rented footwear. A graduate of Miami University, he grew up in a family of six children in Upper Arlington, Ohio. He lives in Chicago within walking distance of four bowling alleys. The Page 69 Test: Bowling Across America. What is Ann Littlewood reading? The current featured contributor to Writers Read: Ann Littlewood, author of the new zoo mystery, Night Kill. Ann Littlewood was a zoo keeper in Portland, Oregon for twelve years. She raised lions and cougars, an orangutan; and native mammals, as well as parrots, penguins, and a multitude of owls. The financial realities of raising primates (two boys of her own) led Ann to exchange a hose and rubber boots for a briefcase and pantsuit in the healthcare industry. Ann has maintained her membership in the American Association of Zookeepers and has kept in touch with the zoo world by visiting zoos and through friendships with zoo staffers. Visit Ann Littlewood's website and blog. Pg. 99: David Archer's "The Long Thaw"
The current feature at the Page 99 Test: David Archer's The Long Thaw: How Humans are Changing the Next 100,000 Years of Earth’s Climate. If you think that global warming means slightly hotter weather and a modest rise in sea levels that will persist only so long as fossil fuels hold out (or until we decide to stop burning them), think again. In The Long Thaw, David Archer, one of the world's leading climatologists, predicts that if we continue to emit carbon dioxide we may eventually cancel the next ice age and raise the oceans by 50 meters. By comparing the global warming projection for the next century to natural climate changes of the distant past, and then looking into the future far beyond the usual scientific and political horizon of the year 2100, Archer reveals the hard truths of the long-term climate forecast. Archer shows how just a few centuries of fossil-fuel use will cause not only a climate storm that will last a few hundred years, but dramatic climate changes that will last thousands. Carbon dioxide emitted today will be a problem for millennia. For the first time, humans have become major players in shaping the long-term climate. In fact, a planetwide thaw driven by humans has already begun. But despite the seriousness of the situation, Archer argues that it is still not too late to avert dangerous climate change--if humans can find a way to cooperate as never before. Revealing why carbon dioxide may be an even worse gamble in the long run than in the short, this compelling and critically important book brings the best long-term climate science to a general audience for the first time. The Page 99 Test: The Long Thaw. Pg. 69: Jeri Westerson's "Veil of Lies"
The current feature at the Page 69 Test: Jeri Westerson's Veil of Lies. Crispin Guest is a disgraced knight, stripped of his rank and his honor - but left with his life - for plotting against Richard II. Having lost his bethrothed, his friends, his patrons and his position in society. With no trade to support him and no family willing to acknowledge him, Crispin has turned to the one thing he still has - his wits - to scrape a living together on the mean streets of London. In 1383, Guest is called to the compound of a merchant - a reclusive mercer who suspects that his wife is being unfaithful and wants Guest to look into the matter. Not wishing to sully himself in such disgraceful, dishonorable business but in dire need of money, Guest agrees and discovers that the wife is indeed up to something, presumably nothing good. But when he comes to inform his client, he is found dead - murdered in a sealed room, locked from the inside. Now Guest has come to the unwanted attention of the Lord Sheriff of London and most recent client was murdered while he was working for him. And everything seems to turn on a religious relic - a veil reported to have wiped the brow of Christ - that is now missing. Learn more about the book and author at Jeri Westerson's website, her "Getting Medieval" blog, and the Crispin Guest Medieval Noir blog. Princeton professor Cornel West's latest book is Hope on a Tightrope. For Newsweek, he named his five most important books. The poems of Philip Larkin. He's renowned for his comic sensibility, but I found mere wit and iciness. "The Fire Next Time" by James Baldwin. His letter to his nephew is wise advice to love and serve. Read more about West's most important books. Pg. 99: Stephen Gundle's "Glamour: A History"
The current feature at the Page 99 Test: Stephen Gundle's Glamour: A History. The Page 99 Test: Glamour: A History. What is Claire Berlinski reading? 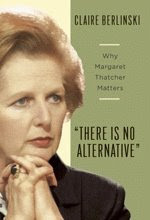 The current featured contributor to Writers Read: Claire Berlinski, author of a new book, There Is No Alternative: Why Margaret Thatcher Matters, just out from Basic Books. She has been published in the New York Times, the Washington Post, the New York Sun, the Oxford International Review, Asia Times, the Weekly Standard, the National Review, Policy Review, Azure, Traveler's Tales, and numerous anthologies. Lion Eyes, the sequel to her novel Loose Lips, was published in Spring 2007. Her first non-fiction book, Menace in Europe, was published in February, 2006. Pg. 69: Joe Barone's "The Body in the Record Room"
The current feature at the Page 69 Test: Joe Barone's The Body in the Record Room. It’s 1954. When a mental patient who calls himself Roy Rogers finds a body in the hospital record room, his investigation leads him to the murder of Marcia Weinhart. Twenty years earlier, authorities found her mutilated corpse lying on the altar of St. Adrian's Catholic Church in Sunrise, Missouri. Roy, his friend Harry, and Harry’s beloved dog, Bullet, move through the buildings and grounds of the Sunrise Mental Hospital, a thousand-acre facility with more than two thousand patients and eight hundred employees. They go from the record room to the hospital’s Catholic chapel, from the blacksmith shop to the hospital cemetery, looking for victims of the terrible abuse behind the Weinhart murder. In the process, Roy comes to better understand the strength and moral stature of his hero, the real Roy Rogers. He is able to overcome the terror of his past, choosing to forgo violence and work within the law. Joe Barone’s debut makes for an intriguing mystery while also elevating old-time heroes and their values. Learn more about the book and author at Joe Barone's website and blog. Joe Barone was raised on the grounds of a state mental hospital in the 1950's. He is a retired ordained minister who lives in Missouri. The Page 69 Test: The Body in the Record Room. The writer James Hynes posted his 2008 list of Halloween stories on his website. "The July Ghost," by A. S. Byatt. This is the newest story in this list—it was published in 1987—and the only one not to come from one of the ancient anthologies of my youth. But it's also one of the best ghost stories I've ever read, and widely anthologized; I have it in several different volumes, including the Leithauser anthology [The Norton Book of Ghost Stories]. It's also, if you know anything about A. S. Byatt's personal history, almost unbearably poignant. Read about another item on Hynes' list. Related: Brad Leithauser's five best ghost tales. Now showing at My Book, The Movie: Steve Brewer's Lonely Street. My Book, The Movie: Lonely Street. What is Alan Jacobs reading? The current featured contributor at Writers Read: Alan Jacobs, a professor of English at Wheaton College in Illinois. He is the author of several books including The Narnian, a biography of C. S. Lewis, and Original Sin: A Cultural History. His literary and cultural criticism has appeared in a wide range of periodicals, including the Boston Globe, The American Scholar, First Things, Books & Culture, and The Oxford American. Alan Jacobs blogs at The American Scene. Pg. 99: J. Howard's "Concentration Camps on the Home Front"
The current feature at the Page 99 Test: John Howard's Concentration Camps on the Home Front: Japanese Americans in the House of Jim Crow. Without trial and without due process, the United States government locked up nearly all of those citizens and longtime residents who were of Japanese descent during World War II. Ten concentration camps were set up across the country to confine over 120,000 inmates. Almost 20,000 of them were shipped to the only two camps in the segregated South—Jerome and Rohwer in Arkansas—locations that put them right in the heart of a much older, long-festering system of racist oppression. The first history of these Arkansas camps, Concentration Camps on the Home Front is an eye-opening account of the inmates’ experiences and a searing examination of American imperialism and racist hysteria. While the basic facts of Japanese-American incarceration are well known, John Howard’s extensive research gives voice to those whose stories have been forgotten or ignored. He highlights the roles of women, first-generation immigrants, and those who forcefully resisted their incarceration by speaking out against dangerous working conditions and white racism. In addition to this overlooked history of dissent, Howard also exposes the government’s aggressive campaign to Americanize the inmates and even convert them to Christianity. After the war ended, this movement culminated in the dispersal of the prisoners across the nation in a calculated effort to break up ethnic enclaves. Howard’s re-creation of life in the camps is powerful, provocative, and disturbing. Concentration Camps on the Home Front rewrites a notorious chapter in American history—a shameful story that nonetheless speaks to the strength of human resilience in the face of even the most grievous injustices. The Page 99 Test: Concentration Camps on the Home Front. Pg. 69: Elizabeth Bear's "All the Windwracked Stars"
The current feature at the Page 69 Test: Elizabeth Bear's All the Windwracked Stars. It all began with Ragnarok, with the Children of the Light and the Tarnished ones battling to the death in the ice and the dark. At the end of the long battle, one Valkyrie survived, wounded, and one valraven – the steeds of the valkyrie. 2500 years later, Muire is in the last city on the dying planet, where the Technomancer rules what’s left of humanity. She's caught sight of someone she has not seen since the Last Battle: Mingan the Wolf is hunting in her city. Read excerpts from All the Windwracked Stars, and learn more about the author and her work at Elizabeth Bear's website and blog. Elizabeth Bear was born on the same day as Frodo and Bilbo Baggins, but in a different year. She is the author of eight sf/f novels, including A Companion to Wolves with Sarah Monette. The Page 69 Test: All the Windwracked Stars. Brad Leithauser, editor of The Norton Book of Ghost Stories, named a five best list of ghost tales for the Wall Street Journal. For reasons perhaps only the dead could explain, the sophisticated ghost story reached its zenith in the Victorian era. Later supernatural fiction tended to be both grislier and less frightening. So there was a special pleasure, for fans of the old-fashioned tale, when Shirley Jackson resurrected the form in 1959 with "The Haunting of Hill House." Her haunted house is an all but living thing, intent on confounding the scientific investigators who come to probe it. Ghost stories often convey a feeling of eerie diminishment, in which the characters grow smaller and smaller as something large and inexplicable and implacable discloses itself. This is wonderfully the case in "The Haunting of Hill House," where the human interlopers dwindle as the "empty" house expands. Read more about Leithauser's list. Pg. 99: Alexander Rose's "American Rifle"
The current feature at the Page 99 Test: Alexander Rose's American Rifle: A Biography. George Washington insisted that his portrait be painted with one. Daniel Boone created a legend with one. Abraham Lincoln shot them on the White House lawn. And Teddy Roosevelt had his specially customized. Now, in this first-of-its-kind book, historian Alexander Rose delivers a colorful, engrossing biography of an American icon: the rifle. Drawing on the words of soldiers, inventors, and presidents, based on extensive new research, and encompassing the Revolution to the present day, American Rifle is a balanced, wonderfully entertaining history of this most essential firearm and its place in American culture. In the eighteenth century American soldiers discovered that they no longer had to fight in Europe’s time-honored way. With the evolution of the famed “Kentucky” Rifle—a weapon slow to load but devastatingly accurate in the hands of a master—a new era of warfare dawned, heralding the birth of the American individualist in battle. In this spirited narrative, Alexander Rose reveals the hidden connections between the rifle’s development and our nation’s history. We witness the high-stakes international competition to produce the most potent gunpowder . . . how the mysterious arts of metallurgy, gunsmithing, and mass production played vital roles in the creation of American economic supremacy . . . and the ways in which bitter infighting between rival arms makers shaped diplomacy and influenced the most momentous decisions in American history. And we learn why advances in rifle technology and ammunition triggered revolutions in military tactics, how ballistics tests—frequently bizarre—were secretly conducted, and which firearms determined the course of entire wars. From physics to geopolitics, from frontiersmen to the birth of the National Rifle Association, from the battles of the Revolution to the war in Iraq, American Rifle is a must read for history buffs, gun collectors, soldiers—and anyone who seeks to understand the dynamic relationship between the rifle and this nation’s history. The Page 99 Test: American Rifle: A Biography. Pg. 69: Steve Carlson's "Final Exposure"
The current feature at the Page 69 Test: Final Exposure by Steve Carlson. The future looks great for David and Rebecca Collier. They are moving into more creative careers and moving to a beach house north of San Francisco. But life is altered considerably one day when Rebecca answers the door to a stranger, who calmly raises a silenced pistol and shoots her dead. In the subsequent chase, David is wounded. He will never walk without a limp and he is nearly deaf when not wearing his rather temperamental hearing aid. He’s plagued by questions, most significantly: Why would anyone want to kill Rebecca? She was the sweetest person in the world---a photographer doing a photo/essay piece on “Northern California Mansions of the ’30s.” Someone wants him dead, too---a second attempt on his life is made before he even gets out of the hospital. With the help of Chuck, his best friend from high school and a cop, David is determined to find the man who killed his beloved wife. Eventually they discover that Rebecca’s murder appears to be tied to one of the old houses she photographed, which guards a mysterious operation by some very dangerous men. Steve Carlson’s debut mystery is a thrilling, emotional ride that signals a new and energetic talent in crime fiction. Steve Carlson has been a working actor and screenwriter for more than thirty years. In his varied career, he has been a series regular on General Hospital, Young and the Restless, and A New Day in Eden on Showtime. He has also guest-starred in hundreds of hours of television and starred or costarred in ten feature films. Steve has written feature films, television episodes, and books on working in acting. Last year he applied the Page 69 Test to his novel, Almost Graceland. Steven Pinker is a professor of psychology at Harvard University. He is the author of several books, including How the Mind Works and, most recently, The Stuff of Thought: Language as a Window Into Human Nature. Pinker told Newsweek about his five most important books. "Principles of Psychology" by William James. Like Mark Twain, James has a witty quote on every subject. "One, Two, Three, Infinity" by George Gamow. A delightful introduction to number theory. Read more about Steven Pinker's most important books. Related: Steven Pinker's "five best" list of of books that explore human nature. Pg. 99: William B. Irvine's "A Guide to the Good Life"
The current feature at the Page 99 Test: A Guide to the Good Life: The Ancient Art of Stoic Joy by William B. Irvine. What is Martha Brockenbrough reading? The current featured contributor to Writers Read: Martha Brockenbrough, author of Things That Make Us (Sic): The Society for the Promotion of Good Grammar Takes on Madison Avenue, Hollywood, the White House, and the World. Martha Brockenbrough is the founder of SPOGG, the Society for the Promotion of Good Grammar, as well as a writer for Encarta.com and the former editor-in-chief of MSN.com. Visit Brockenbrough's websites at www.SPOGG.org, www.thingsthatmakeussic.com and www.nationalgrammarday.com. Read an excerpt from Things That Make Us (Sic). Pg. 69: Matt Bondurant's "The Wettest County in the World"
The current feature at the Page 69 Test: Matt Bondurant's The Wettest County in the World. White mule, white lightning, firewater, popskull, wild cat, stump whiskey, or rotgut -- whatever you called it, Franklin County was awash in moonshine in the 1920s. When Sherwood Anderson, the journalist and author of Winesburg, Ohio, was covering a story there, he christened it the "wettest county in the world." In the twilight of his career, Anderson finds himself driving along dusty red roads trying to find the Bondurant brothers, piece together the clues linking them to "The Great Franklin County Moonshine Conspiracy," and break open the silence that shrouds Franklin County. In vivid, muscular prose, Matt Bondurant brings these men -- their dark deeds, their long silences, their deep desires -- to life. His understanding of the passion, violence, and desperation at the center of this world is both heartbreaking and magnificent. Read an excerpt from The Wettest County in the World, and learn more about the author and his work at Matt Bondurant's website. Matt Bondurant received a B.A. and an M.A. in English at James Madison University and a Ph.D. at Florida State University where he was a Kingsbury Fellow. His short fiction has appeared in journals such as Glimmer Train, Prairie Schooner, and New England Review, among others. His first novel, The Third Translation, was sold in fifteen countries. The Page 69 Test: The Wettest County in the World. Now showing at My Book, The Movie: Humphrey Hawksley's Security Breach. Bob Stanley, music writer and a member of the pop band St Etienne, named a "critic's chart" of top books about Elvis for the (London) Times. Short on scandal but still an astonishing tale from the King's teen bride. Read about Number One on Stanley's chart. Pg. 99: Marco Iacoboni's "Mirroring People"
The current feature at the Page 99 Test: Marco Iacoboni's Mirroring People: The New Science of How We Connect with Others. What accounts for the remarkable ability to get inside another person’s head—to know what they’re thinking and feeling? “Mind reading” is the very heart of what it means to be human, creating a bridge between self and others that is fundamental to the development of culture and society. But until recently, scientists didn’t understand what in the brain makes it possible. Mirroring People is the first book for the general reader on this revolutionary new science. The Page 99 Test: Mirroring People. Pg. 69: Martin Corrick's "By Chance"
The current feature at the Page 69 Test: Martin Corrick's By Chance. An author whose debut novel, The Navigation Log, garnered him comparisons with Waugh and Maugham, Martin Corrick now returns with a story even more dazzling. By Chance is both suspenseful and thought-provoking, a philosophical tale that is rivetingly readable. “The events that resulted in Bolsover’s presence at the Alpha Hotel are closely related to his memories of his wife.” James Watson Bolsover is an apparently normal middle-aged man, a shy yet soulful engineer turned technical writer who for many years shared a passionate marriage with his lovely wife, Katherine. Bolsover’s wife and his deep interest in his work made his life perfect, but then–by chance, misfortune, bad luck–he lost Katherine and, with her, his innocence. Now he travels by sea to a remote island and checks into what seems to be an ordinary hotel; in this safe haven he hopes to understand the past and start afresh. But we quickly discover that all of the hotel’s occupants, like Bolsover himself, have uncertain histories: All of them are “someone else,” seeking to leave their former lives behind. As Bolsover grows accustomed to his new surroundings–and close to a new woman–the truth of his life trickles out like blood from a wound. He is not quite the simple fellow he seems, but a man who has carefully shielded his own history not only from others but also from himself. Culpability, identity, morality, and luck–all these play a part in a story that echoes our own lives. Learn more about By Chance at the Random House website. Martin Corrick is the author of the acclaimed debut novel, The Navigation Log. He holds an MA in creative writing from the University of East Anglia and for much of his working life was a university lecturer, but he has also worked as a journalist and copywriter. The Page 69 Test: By Chance. What is Peter Dauvergne reading? The current featured contributor to Writers Read: Peter Dauvergne, author of the newly released The Shadows of Consumption and other works on the politics of global environmental change. Peter Dauvergne is Professor of Political Science and Canada Research Chair in Global Environmental Politics at the University of British Columbia. His research focuses on the politics of global environmental change, including current projects on sustainable consumption and corporate social responsibility. In addition to The Shadows of Consumption (MIT Press, 2008), his books include Paths to a Green World (MIT Press, 2005) (with Jennifer Clapp), Loggers and Degradation in the Asia-Pacific (Cambridge University Press, 2001), and Shadows in the Forest (MIT Press, 1997), winner of the 1998 Sprout Award from the International Studies Association for the best book in global environmental affairs. Read more about The Shadows of Consumption, and visit Peter Dauvergne's faculty webpage. Pg. 99: David Fromkin's "The King and the Cowboy"
The current feature at the Page 99 Test: David Fromkin's The King and the Cowboy: Theodore Roosevelt and Edward the Seventh, Secret Partners. The story of the unlikely friendship between King Edward the Seventh of England and President Theodore Roosevelt, which became the catalyst for an international power shift and the beginning of the American century. In The King and the Cowboy, renowned historian David Fromkin reveals how two unlikely world leaders—Edward the Seventh of England and Theodore Roosevelt—recast themselves as respected political players and established a friendship that would shape the course of the twentieth century in ways never anticipated. In 1901, these two colorful public figures inherited the leadership of the English-speaking countries. Following the death of his mother, Queen Victoria, Edward ascended the throne. A lover of fine food, drink, beautiful women, and the pleasure-seeking culture of Paris, Edward had previously been regarded as a bon vivant. The public—even Queen Victoria herself—doubted Edward’s ability to rule the British Empire. Yet Edward would surprise the world with his leadership and his canny understanding of the fragility of the British Empire at the apex of its global power. Across the Atlantic, Vice President Roosevelt—the aristocrat from Manhattan who fashioned his own legend, going west to become a cowboy—succeeded to the presidency after President McKinley’s 1901 assassination. Rising above criticism, Roosevelt became one of the nation’s most beloved presidents. The King and the Cowboy provides new perspective on both Edward and Roosevelt, revealing how, at the oft-forgotten Algeciras conference of 1906, they worked together to dispel the shadow cast over world affairs by Edward’s ill-tempered, power-hungry nephew, Kaiser Wilhelm II of Germany. At Algeciras, the U.S and major European powers allied with Britain in protest of Germany’s bid for Moroccan independence. In an unlikely turn of events, the conference served to isolate Germany and set the groundwork for the forging of the Allied forces. The King and the Cowboy is an intimate study of two extraordinary statesmen who—in part because of their alliance at Algeciras—would become lauded international figures. Focusing in particular on Edward the Seventh’s and Theodore Roosevelt’s influence on twentieth-century foreign affairs, Fromkin’s character-driven history sheds new light on the early events that determined the course of the century. The Page 99 Test: The King and the Cowboy. Pg. 69: Zoë Sharp's "Third Strike"
The current feature at the Page 69 Test: Zoë Sharp's Third Strike. The last person that professional bodyguard, Charlotte “Charlie” Fox, ever expected to self-destruct was her own father, an eminent surgeon. But when Charlie unexpectedly sees him admitting to gross professional misconduct on a New York news program, she can’t just stand by and watch his downfall. That’s not easy when Richard Foxcroft, always cold towards his daughter, rejects her help at every turn. The good doctor has never made any secret of his disapproval of Charlie’s choice of career – or her relationship with her boss, Sean Meyer. And now, just as Charlie and Sean are settling in to their new life in the States, Foxcroft seems determined to go down in a blazing lack of glory, and take Charlie and everyone she cares about down with him. But he has not bargained on Charlie’s own ruthless streak. And when the game turns deadly, Charlie will need to stake her life and her father’s against a formidable foe. Read an excerpt from Third Strike, and learn more about the author and her work at Zoë Sharp's website. Zoë Sharp's professional writing career began in 2001 with Killer Instinct, the first Charlie Fox book. This novel was followed by Riot Act, Hard Knocks, and First Drop, which earned a nomination for a Barry Award for Best British Crime Novel. Road Kill and Second Shot are the fifth and sixth titles in the series. James M. McPherson, author of the Pulitzer Prize-winning Battle Cry of Freedom and the newly released Tried by War: Lincoln as Commander in Chief, named a five best list of "books about the Civil War away from the battlefield" for the Wall Street Journal. Read more about McPherson's list. Learn more about McPherson's Tried by War: Lincoln as Commander in Chief. Pg. 99: Ariel Sabar's "My Father’s Paradise"
The current feature at the Page 99 Test: Ariel Sabar's My Father’s Paradise: A Son’s Search for his Jewish Past in Kurdish Iraq. In a remote and dusty corner of the world, forgotten for nearly three thousand years, lived an ancient community of Kurdish Jews so isolated that they still spoke Aramaic—the language of Jesus. Mostly illiterate, they were self-made mystics and gifted storytellers, humble peddlers and rugged loggers who dwelt in harmony with their Muslim and Christian neighbors in the mountains of northern Iraq. To these descendants of the Lost Tribes of Israel, Yona Sabar was born. In the 1950s, after the founding of the state of Israel, Yona and his family emigrated there with the mass exodus of 120,000 Jews from Iraq—one of the world's largest and least-known diasporas. Almost overnight, the Kurdish Jews' exotic culture and language were doomed to extinction. Yona, who became an esteemed professor at UCLA, dedicated his career to preserving his people's traditions. But to his first-generation American son Ariel, Yona was a reminder of a strange immigrant heritage on which he had turned his back—until he had a son of his own. My Father's Paradise is Ariel Sabar's quest to reconcile present and past. As father and son travel together to today's postwar Iraq to find what's left of Yona's birthplace, Ariel brings to life the ancient town of Zakho, telling his family's story and discovering his own role in this sweeping saga. What he finds in the Sephardic Jews' millennia-long survival in Islamic lands is an improbable story of tolerance and hope. Populated by Kurdish chieftains, trailblazing linguists, Arab nomads, devout believers—marvelous characters all— this intimate yet powerful book uncovers the vanished history of a place that is now at the very center of the world's attention. What is Peter Golenbock reading? The current featured contributor to Writers Read: Peter Golenbock, whose books include two titles which hit the bookstands last Tuesday, In the Country of Brooklyn and American Prince, a book he wrote with Tony Curtis. His biography of George Steinbrenner comes out in the spring. Learn more about Peter Golenbock and his work at his official website and blog. Pg. 69: Laurie Graff's "The Shiksa Syndrome"
The current feature at the Page 69 Test: Laurie Graff's The Shiksa Syndrome. Manhattan publicist Aimee Albert knows a good spin, but she’s the one who winds up reeling when her gorgeous, goyishe boyfriend breaks up with her—on Christmas! For a stand-up comedian, you’d think he would have better timing. But Aimee’s not about to let a man who doesn’t even have a real job get her down. She dusts herself off and decides to seek companionship with a member of her own tribe. There’s just one problem: all the shiksas are snapping them up! So when the very cute, Jewish, and gainfully employed Josh Hirsch catches Aimee’s eye at a kosher wine tasting and mistakes her for a shiksa, what’s a girl to do? Hey, her heart was broken, not her head! Unfortunately, the charade goes on longer than Aimee planned, and her life becomes more complicated than a Bergman film. To make matters worse, Josh and Aimee aren’t exactly on the same page as far as their attitudes toward Judaism go, creating tension in the relationship. But as Aimee begins to discover that her identity isn’t as easily traded as a pair of Jimmy Choos, she must decide if having the man of her dreams is worth the price of giving up so much of who she is. Wry and witty, The Shiksa Syndrome is a by turns laugh-out-loud funny and disarmingly poignant. Read an excerpt from The Shiksa Syndrome, and learn more about the author and her work at Laurie Graff's website and The Shiksa Syndrome on MySpace. Laurie Graff is the author of the novels You Have to Kiss a Lot of Frogs and Looking for Mr. Goodfrog. The Page 69 Test: The Shiksa Syndrome. What is Andy Clark reading? The current featured contributor to Writers Read: Andy Clark, Professor of Philosophy in the School of Philosophy, Psychology and Language Sciences, at the University of Edinburgh in Scotland, and the author of several books including Being There: Putting Brain, Body and World Together Again, Natural-Born Cyborgs: Minds, Technologies and The Future Of Human Intelligence, and the newly released Supersizing the Mind: Embodiment, Action, and Cognitive Extension. Visit Andy Clark's University of Edinburgh webpage. John Edward Hasse, curator of American Music at the Smithsonian's National Museum of American History, founder of national Jazz Appreciation Month, and author of Beyond Category: The Life and Genius of Duke Ellington, named a five best list of books on jazz for the Wall Street Journal. Don't be put off by the massive size of this anthology. You can dip into its 1,068 pages one piece at a time. Robert Gottlieb, former editor of The New Yorker, has judiciously selected and excerpted 106 examples of the most memorable English-language writing on jazz, culled from books and magazines between 1919 and the 1990s. In the autobiographical entries, we learn about the thoughts and experiences of musicians such as Louis Armstrong, Duke Ellington, Anita O'Day and Miles Davis. In "Reading Jazz" we also encounter the work of gifted writers, including Ralph Ellison, Martin Williams, Nat Hentoff, Gary Giddins and Dan Morgenstern. Their essays and criticism further strengthen this cornerstone collection. Read about Number One on Hasse's list. Pg. 99: John Kane's "Between Virtue and Power"
The current feature at the Page 99 Test: John Kane's Between Virtue and Power: The Persistent Moral Dilemma of U.S. Foreign Policy. In this survey of U.S. history, John Kane looks at the tensions between American virtue and power and how those tensions have influenced foreign policy. Americans have long been suspicious of power as a threat to individual liberty, Kane argues, and yet the growth of national power has been perceived as a natural byproduct of American virtue. This contradiction has posed a persistent crisis that has influenced the trajectory of American diplomacy and foreign relations for more than two hundred years. Kane examines the various challenges, including emerging Nationalism, isolationism, and burgeoning American power, which have at times challenged not only foreign policy but American national identity. The events of September 11, 2001, rekindled Americans' sense of righteousness, the author observes, but the subsequent use of power in Iraq has raised questions about the nation’s virtue and, as in earlier days, cast a deep shadow over its purpose and direction. The Page 99 Test: Between Virtue and Power. What is Rachel Toor reading? Pg. 69: Todd Hasak-Lowy's "Captives"
Pg. 99: Robert Buettner's "Orphan's Alliance"
Pg. 69: Karen Maitland's "Company of Liars"
What is Nick Bostrom reading? Pg. 69: Ad Hudler's "Man of the House"
What is Asali Solomon reading? Pg. 99: Alexander & Nicholas Humez's "On the Dot"
Pg. 69: Craig McDonald's "Toros & Torsos"
What is Joe Abercrombie reading? Pg. 99: Peter Mansoor's "Baghdad at Sunrise"
Pg. 69: Keir Graff's "One Nation, Under God"
What is Martin Millar reading? Pg. 99: Ray Taras' "Europe Old and New"
Pg. 69 & 99: William G. Tapply's "Hell Bent"
What is Susan Reinhardt reading? Pg. 99: Michael Kimball's "Dear Everybody"
Pg. 69: Andrew Peterson's "First to Kill"
Pg. 99: David S. Reynolds' "Waking Giant"
What is Dan Hooper reading? Pg. 69: Betsy Thornton's "A Song for You"
Pg. 99: Lisa Lutz's "The Spellman Files"
Pg. 69: David Fuller's "Sweetsmoke"
What is Thomas P. Slaughter reading? Pg. 99: Diana Spechler's "Who By Fire"